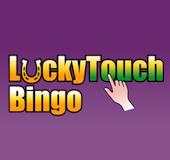 Lucky Touch Bingo | Deposit £10 Play with £45! Launched in October 2012, Lucky Touch Bingo is colourful addition to the popular Winner Bingo Network. The site also uses popular Cozy Games software, so has a similar look to some other Cozy Games websites. But the reels are overflowing with fab and generous welcome offers, exciting bonuses, fantastic bingo and slots and fabulous chat hosts. 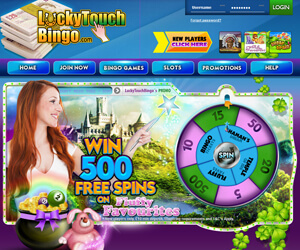 In 2016, Lucky Touch Bingo was given a fresh revamp, and unveiled a sleek, colourful purple, blue, green and pink interface. The splash screen welcomes you to a magical castle setting, with a stunning girl holding a magic wand, next to a lucky pot of gold. When you sign up to the site and deposit your first £10, you can spin the lucky wheel to win up to 500 free spins on Fluffy Favourites or bingo tickets. Every time you deposit more than £10, you can also collect another spin on the prize wheel. As part of the Winner Bingo Network there are tons of great guaranteed jackpot games and networked promotions to join in with, where the prize pots on offer are even bigger than usual. You can then continue your lucky streak with a range of lucky promotions like the Fortune Fountain, £250 Balance Booster game, All or Nothing, and Free Bingo. There are always exclusive offers at Lucky Touch Bingo, check here for the latest exclusive bonus codes. There are also regular free gaming sessions and plenty of different bingo variations to enjoy from 90-ball to speed 30-ball games. The chat rooms are full of fun and a great community atmosphere and players will soon feel right at home. You can also head to the slots suite to spin through all the pop classics like Fluffy Favourites, Jewel Journey, Shaman's Dream, and Temple of Isis, as well as hot new releases. Whether you're at home or on the go, you can also continue spinning on your mobile! 2. Follow the on-site instructions and register. Have you got the Lucky Touch? Try the bingo site to see for sure!